Hi, my name is Miriam and I’m from Long Island, New York; it’s in the Orange color group for our spring garden. My husband and I started our garden in 2010. We started late but had great success with everything we palnted. We used regular, good quality soil (delivered from our local nursery) mixed with organic compost and we’re adding compost to the bed at the beginning of each planting season to bulk it up. 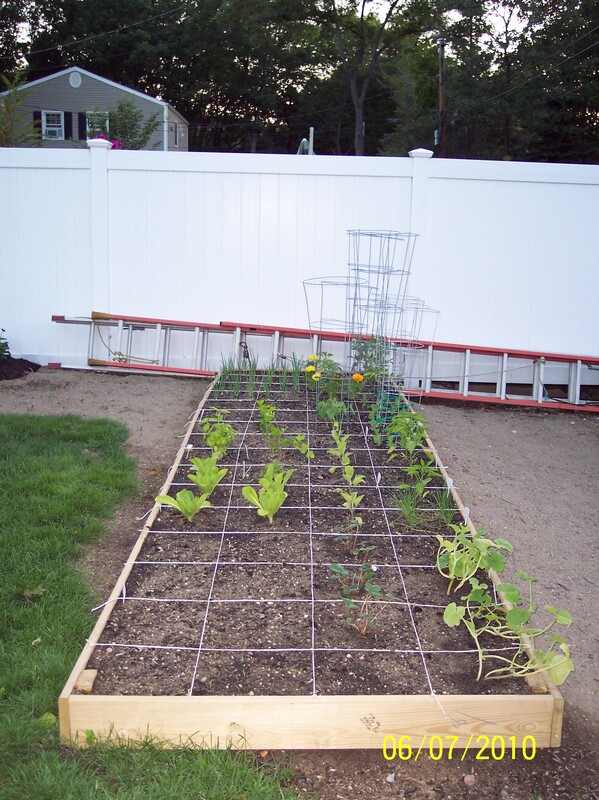 The bed is 4×16 feet long and it sticks out away from the fence and into the yard which gives 3/4’s of the bed full sun all summer, and still allows me to plant shade tolerant veggies in the 1/4 that is closest to the fence (usually lettuce, onions). I was watering the garden almost daily the first year and noticed my tomatoes were splitting. Last year I changed the location of the tomatoes to the middle of the garden where the sprinklers hit everyother day, and the tomatoes were perfect. I was VERY pregnant all last summer, and basically ignored the garden with the exception of some crazy weeding during a ‘nesting’ episode 2 weeks before delivering, and the garden flourished! We had so many tomatoes half of them rotted before my husband could pick them! This year I’m hoping to be a little more vigilant than last year (and actually weed and fertilize), but I think I may keep from hand watering anything and re-set the sprinklers to hit the whole bed as that seemed to work really well last year. My biggest worries are the carrots and peas. I have no idea when to harvest the carrots and the first year I think I waited too long and they tasted bitter. I also worry about fertilizing the peas, it seemed that every time I did, the flowers would fall off and I had a so-so crop. Also, I have strawberries planted in the last 4 feet of the bed that have taken over those 16 squares, I’m going to attempt to contain them there before they take over the entire bed; any suggestions? 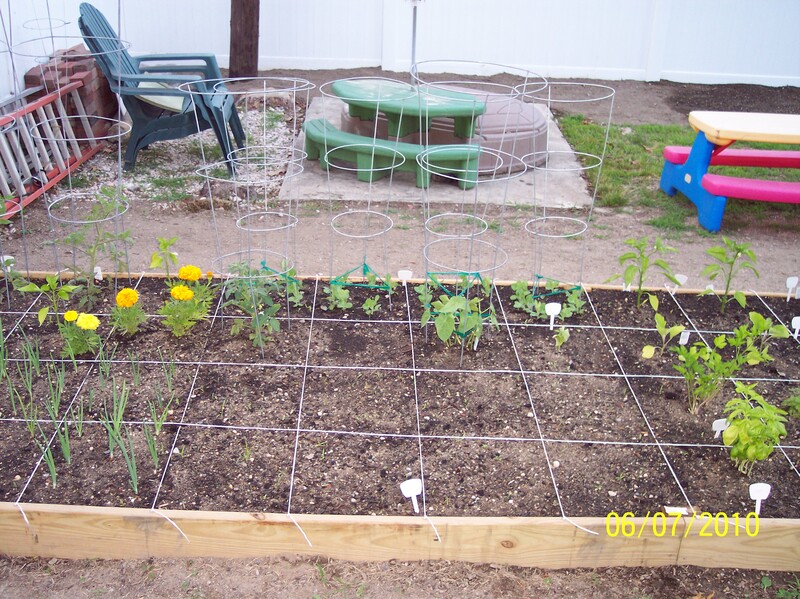 The only changes I’d like to make to the bed this year are the addition of some kind of netting or fencing because the squirrels and birds are feasting on all of the fruits and veggies! 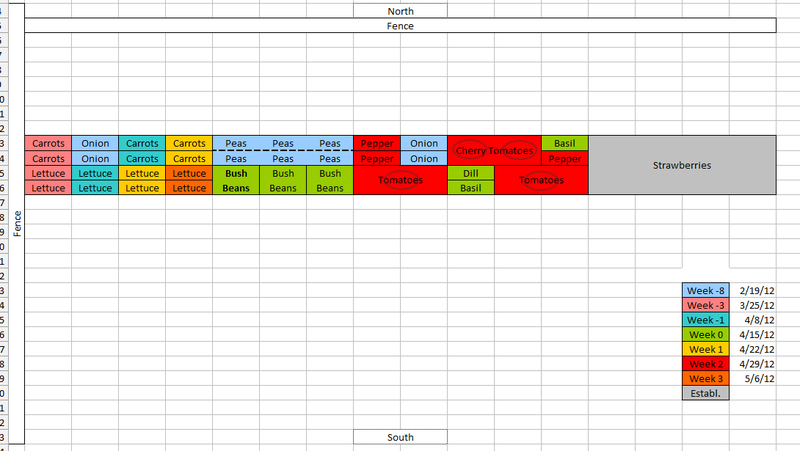 And, I’d like to attempt planting something new when the early veggies are out. Thank you for taking a look at my plan, your website has been an inspiration to me and I can’t wait to hear your thoughts about my garden! Pam, thanks for the info! I’ve seen both types of growth in my strawberries, it’s been a couple of years now, and the original spindly-looking plants you see in my pictures are now about 5 times as big and they’ve taken over a quarter of my garden (which is fine with me, as my 4 year old LOVES strawberries and I’ve yet to taste more than a bite of the smallest one because of her!). But, I think I may take your advice and move them to their own container this year or I may lose the entire garden to them. Do you know if they do well when transplanted, when I should transplant them, or if I should do anything special to the soil so I don’t lose them? Hello Miriam, the strawberries increase two ways – the original plant increases in size and the plants also send out runners above the ground – they are stalks with little plants along them – where they touch the ground they root and make fresh plants. Putting a barrier over the soil will hinder them but the stalks can be quite long and will often find uncovered soil. Best way if you need to contain them is to plant them in their own container and when you see the new plantlets cut them off before they root. Thank you so much! I guess I didn’t water the carrot enough because they were woodytasting and bitter (what a disappointment that was!). As for the strawberries-are they like bamboo where they send shoots out under ground-should I put a plastic border above ground only or extend the barrier below the surface as well? Miriam–such a fun garden! What I LOVE about the square foot gardening method is that even when it’s left untended the weeds don’t take over! *Strawberries: they will grow and take over if you let them. Strawberries are a great ground cover, so if you have flower beds you might even consider giving them a spot to spread. I have never grown them, but my suggestion would be to put some kind of physical barrier between those sections of the garden. Wood or particle board would work, but degrade. Plastic might be better. *Carrots: I would suggest looking at the seed packet when you plant, and marking your calendar. It should tell you how many days from seed to harvest. Write it down, and come back on that day and pull one up. You should be able to tell by the length if it’s ready(did it grow as tall as the packet said?). If they are ready, you can either harvest all at once or eat them over the next week or two. One thing to note–if carrots and other root veggies get too much water they will be “hairy” with tons of fine little mini-roots. If they get too little water they will be woody and bitter. The most common reason for flowers to drop is temperatures that are too warm. Are you planting your peas early (mid-Feb to mid-March) and growing them in the cool spring? As for protecting your garden, watch for a post on this coming next week!